Shadow or "mirror" juries run concurrently with your actual trial. These "jurors" remain in the courtroom when the actual panel is present, leave when they do, and are exposed to all the evidence, testimony and courtroom instructions the actual jurors experience. They are interviewed at least once daily by Arizona Jury Research, and usually twice, to obtain feedback on trial proceedings, witness and client credibility, clarity of issues, persuasiveness of arguments, and attorney presentations. 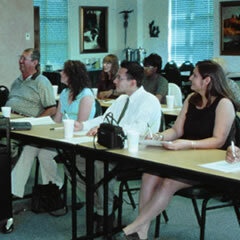 Based on continuous feedback, you can make adjustments where needed before excusing the jury for deliberations. To the right is a graph regarding feedback on an expert witness testifying as to whether or not a seatbelt or lap restraint system would have saved a young boy's life. (The names have been changed to ensure confidentiality.) Five shadow jurors followed the trial and were interviewed both at noon, and the end of the day by AJR staff. Reports were made to counsel twice a day. During a lunch break, Dr. Jones' intended testimony was modified to clarify issues causing confusion to the shadow jurors. More consistent ratings followed the afternoon testimony. Shadow juries can be used for the entire trial, or just extremely important portions such as expert witness testimony, client testimony, or opening statements. 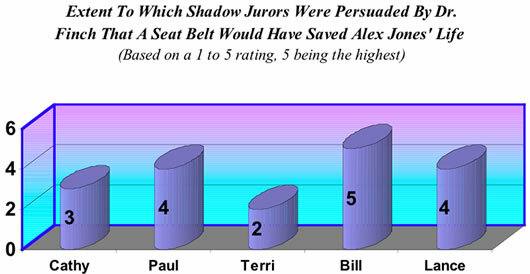 Even just two shadow jurors can provide highly illuminating and valuable feedback during your trial.